To communicate more easily and effectively and get feedback from our Parish Community St. Mary adopted a new and improved way of communicating powered by a service called Flocknote. Like sending a "note" to your "flock". 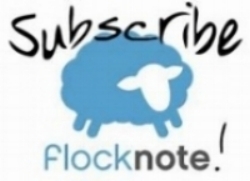 Flocknote. Using Flocknote provides us a solution that allows us to easily send you the information you care about most via email and text message and gives you the ability to provide essential feedback to improve the Parish. In addition to any groups or ministries you may sign up for to receive communications (Food Pantry, Religious Education, Vacation Bible School, etc. ), we can also use Flocknote to send you inclement weather announcements, updates about special events and other important information. You can join our Flocknote community by just taking take a minute to sign up and it lets you receive email or text messages from the groups and ministries that you choose. It even allows you to reply directly back to those messages so we can get feedback and hear from you in an efficient manner. Your info is kept totally private. If you would like to join it is simple. Just provide the following information and you’ll be all set!